Oops - A bioenergetic approach to restoring gut function part 1 was almost two years ago, my studies got the better of me, I’m sorry. Following on from the information of how to restore energy and digestion by simply removing foods that are difficult to digest, promote endotoxin, decrease energy and digestion. Replacing them with easily digested, protective nutrients can negate the need for expensive, reduced testing and a supplement list that causes you to rattle as you stroll down the street. Much like the decreased need for stool testing, I have rarely recommended a food allergy or sensitivity test for the same reason that I haven’t used a stool test for many years (or had the luxury of a nice cash kickback from the labs I used to use). Why? Because these tests show the body in a stressed, energy wasting state that is prone to inflammation and reacts with many foods like dairy. Is it the food? No. Could it be you? It’s possible. 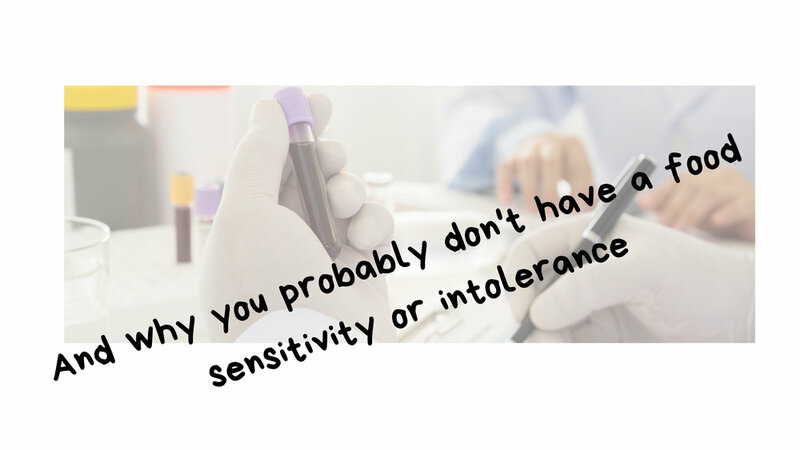 Many clients have rolled into the office clutching their food sensitivity tests in a file, with dozens of other tests. Red bars, yellow bars, all highlighting so called problem foods. During bouts of stress (pollution exposure, psychological, under eating etc, excessive exercise, poor sleep) the body is prone to decreasing available levels of organisational hormones such as thyroid and progesterone. Usually the adrenal glands have to pick up the slack and compensatory stress hormones such as cortisol, glucagon, adrenaline and activation of serotonin (not a hormone) which suppress thyroid and progesterone are perpetuated. This often creates a high sodium (salt) and magnesium wasting state and poor digestive function that facilitates increased sensitivity via increased serotonin and histamine levels. This also increases demand for vitamin C for gut mucosa maintenance and adrenal responses. If this state is perpetuated increases in endotoxin (the by-product of bacterial metabolism and degradation ) burden the digestive system, liver, and can damage the gastrointestinal lining. Endotoxin levels are also increasing through airborne environmental pollutants such as polycyclic aromatic hydrocarbons from fossil fuel use and industry (Annamalai & Namasivayam, 2015), so it’s worth considering that some people in a high pollution area, with poor digestive function are at increased risk of presenting with food sensitivities. They get tested, part with their cash and told to cut out 20 foods that they eat on a regular basis. Problem solved? Well no, it’s an intervention that will have some success but it’s some distance of what the person really needs. To simplify some of the well-known digestive issues with two ends of the spectrum. Constipation – failure to go to poop daily, hard to pass. IBS irritable bowel like issues. Loose often more than 3 times per day. There’s plenty of reasons to link constipation with a low energy, functionally hypothyroid, subclinical or overt hypothyroid state (Lauritano et al., 2007) and increased bacterial overgrowth like SIBO or small intestinal bacterial overgrowth. The digestive system is energy and thyroid hormone dependant and restoring energy by supplying easily digested high energy foods can be a simple intervention with effective results. Often when you dig into a person’s history, you might find that those with IBS like states often describe a period of constipation. It’s not impossible to suggest that sustained constipation will lead to increased endotoxin, serotonin and histamine that damages the bowel lining. When this environment is perpetuated by stress, poorly digested foods and low energy, the digestive system is maintained in a high stress state, sensitive and ready to reject any remotely objectionable substance. Any food can become problematic when the digestive system is over-burdened or sustains damage to enzyme producing structures in the villi and microvilli. Magnesium in forms such as chloride and glycinate or very useful for decreasing perceived stress and lowering the incidence of sensitivities and 400mgs to 1g is useful to experiment with and complements dietary changes suggested. To restore bowel movement magnesium sulphate or Epsom salts will mobilise the digestive tract and I have found that clients if needed try half to a full teaspoon to grease the wheels. Vitamin C is a great way of decreasing constipation. A few years back I would recommend a dose of 1-2 grams but equally I feel adequate intake of orange juice will do a great job. The added benefit of orange juice (polyphenols) has been shown to decrease inflammation and endotoxin which is often present in both high fat and carbohydrate meals (Ghanim et al., 2010). Cascara Sagrada If you need a good clear out to restart function then cascara is an extremely effective solution. ‘ An effective laxative (besides preventing inflammation) causes not only coordinated contraction of the smooth muscles of the intestine, but also adjusts secretions and absorption, so that an appropriate amount of fluid stays in the intestine, and the cells of the intestine don’t become water-logged.’ Ray Peat. Caffeine seems a logical choice and the research on caffeine as a potent factor in the fight against cancer and neuro degenerative diseases such as dementia and Alzheimer’s disease is very positive. Coffee stimulates bowel function and like the suggestions above is useful to decrease the reabsorbed metabolites and toxins that may be instrumental in systemic inflammation. The aerobic/respiratory system is enhance and protected by coffee consumption, providing protection to the mitochondria (Eskelinen & Kivipelto, 2010). Carrots I have posted about the power of grated carrot to reduce the irritated state many times and have seen some clients with over 20 years of IBS resolve with this simple addition. Carrots act as a natural antibiotic, lowering endotoxin and other bacterial end products (Babic, Nguyen‐the, Amiot, & Aubert, 1994) and bamboo shoots have the same effect. As increased bacterial issues stimulate endotoxin production the daily use of a carrot salad can be one of the simplest yet most effective tools that you can have to improve bowel function. Bone broth, gelatin and glycine are also great for helping to support gastrointestinal mucosa, improve the brush border enzyme function and decrease the proinflammatory effects of eating tryptophan and iron rich muscle meats that can also irritate the bowel when excessive. Mushrooms when boiled also have a similar effect as the carrot by decreasing aromatase enzymes and estrogen acting as a natural antibiotic. I would challenge anyone who either has paid money for a food sensitivity test or who is thinking about it ,to simply try the suggestions set out in these two posts. Over the last few years I haven’t seen anyone who has failed to improve digestive function. Although sometimes other mechanisms involving hormones may need to be explored.